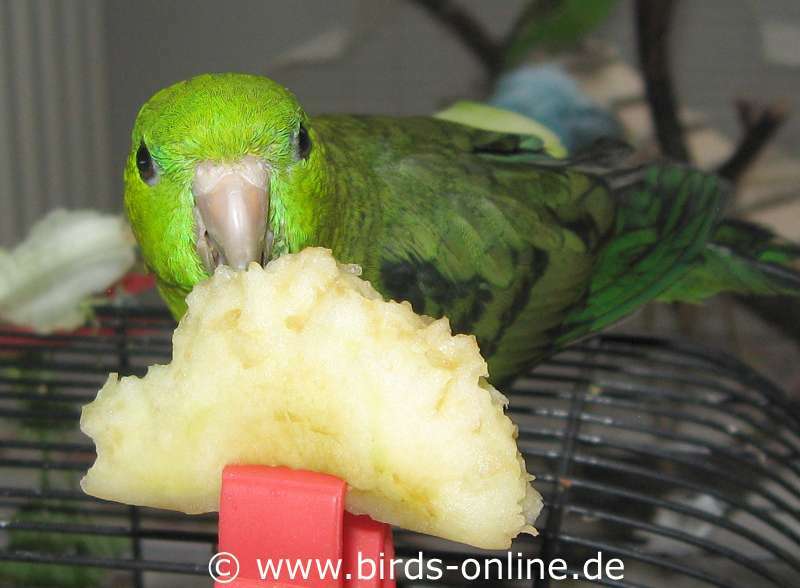 Fresh fruits are a highly appreciated for many pet birds who are used to eating fresh food. But anyhow, some birds who don't know fruit won't eat it or are even frightened when it is offered to them. But if you keep on serving sweet apples or pears to your birds, some day even the most stubborn "fruit ascetic" will most probably start to like the taste. Another advantage of fresh fruit is that it brings fun into the everyday life of a pet bird. Many birds love to play with their food, and also the nutrients (vitamins, minerals) are related with an enormous health benefit for your birds. 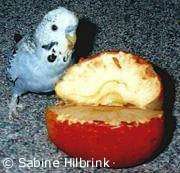 You should serve them different kind of fruit because all birds have their favourite food and by offering a variety of fresh stuff your birds will be able to choose what they like best. For example the linnie who is shown above loves to eat apples. 1) Clementines and related sorts of fruit such as Mandarins contain a lot of natural acid. Some birds tend to show troubles with their digestive tract in case they eat a lof of this kind of food. So you should make sure to serve small amouts only. 2) Some food stores offer dried dates and figs that are not extra sweetened. Such dried dates and figs can be served to pet birds. Please do not offer this food to them too often because it contains a lot of fructose and your birds can gain too much weight from it. 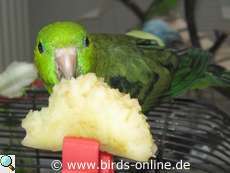 3) Any kind of melon is a highly appreciated goody for all pet bird species. From water melon to honeydew melon and cantaloupe melon, everything can be served to your feathered friends. 4) Pet birds do not only love to eat the berries but also the leaves of the mulberry plant. Do you think there is any sort of fresh fruits missing on this page? If so, please feel free to drop me a line. Thank you! Food clips - where can you get them? Dear international readers, I recieved several messages with the question where one can buy the food clips like the one that is shown in the picture on top of the page. I live in Germany and I suppose it won't be helpful for you to know where you could buy them in my country. Regrettably I can't answer that question for each and every other country in the world, but I think that it's quite easy for you to find a shop that will ship these clips to your country.